Utility lineworkers usually work for utility or power companies but their skills may help them find work in other companies as well. They typically install, maintain, and repair electrical lines that provide power to a region including houses and businesses. 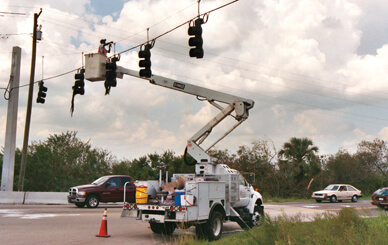 The work can include climbing poles or using truck-mounted buckets to access lines, digging holes to set poles, trenching to run lines underground, and splicing or soldering cables to overhead transmission lines. They may also install or move traffic lights.